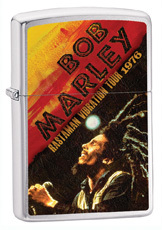 Officially licensed Bob Marley Rastaman Chrome Zippo Refillable Lighter. 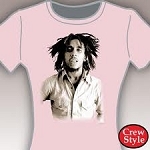 Features a design of the legend that says, 'Rastaman Vibration Tour 1976.' Brushed chrome. Zippo Lighters are an American tradition, that is manufactured right here in the Great US of A. We are proud to sell a product that has withstood the test of time for more than 75 years! All Zippo Lighters are backed by a lifetime Zippo warranty. Any Zippo pocket lighter, when returned to our factory, will be put in first-class mechanical condition free of charge, for we have yet to charge a cent for the repair of a Zippo pocket lighter, regardless of age or condition. The finish, however, is not guaranteed. Zippo lighters are collected by many and make great gifts!